The Town of Melbourne Beach is an ideal barrier island community featuring all of the elements you’d expect in a charming coastal town – historic buildings, beautiful beaches and parks, local shops, restaurants and inns. The area is perfect for families and boasts outstanding schools and local sports programs. 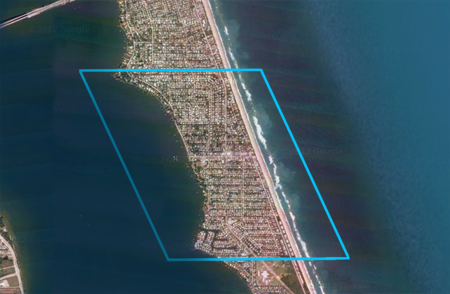 On southern Brevard County’s barrier island peninsula, everything south of Indialantic is generally refered to as “Melbourne Beach.” But the boundaries of the actual Town of Melbourne Beach run from the Indialantic border (just south of Miami Ave.) to the southern edges of the Breakers Condominiums on the beach and community of Harbor East on the river. 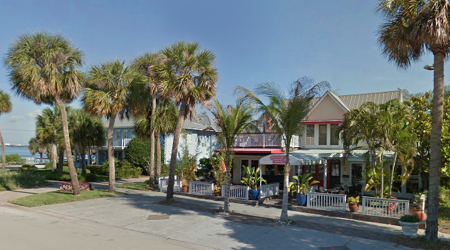 Info: Shaded sidewalks line Ocean Avenue, the main street of Melbourne Beach, featuring inns, restaurants, shopping, banks, town hall, library, community center and post office. Parks: Ocean Avenue features outstanding parks at either end – a community dock and beautiful Ryckman Park are on the riverfront. The park features large oak trees, tennis courts, sunset views, bocci ball, picnic tables, gazebos. Ryckman Park is the home of the annual Founders Day celebration and has become a favorite local wedding venue. 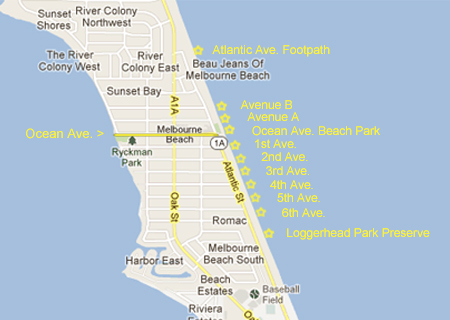 To the east, Ocean Avenue Beach Park includes ample parking, shower and bathroom facilities, and volleyball. Beaches: Melbourne Beach is famous for its pristine beaches, great fishing and even better surfing! The town offers numerous public access points to it’s fabulous beaches, as indicated by yellow stars in the map above. Parking where available and beach access are free of charge at all locations, but no parking is permitted at the Atlantic Avenue footpath or at Loggerhead Park Preserve. Home styles – Generally a well-maintained community, with homes varying greatly in age, condition, style and size. Dale Sorensen Real Estate, Inc.